The VooPoo X217 comes in a rectangular cardboard box with a colorful sketch of the device on the front, and a list of contents, the usual safety warning, as well as information about the manufacturer on the back. 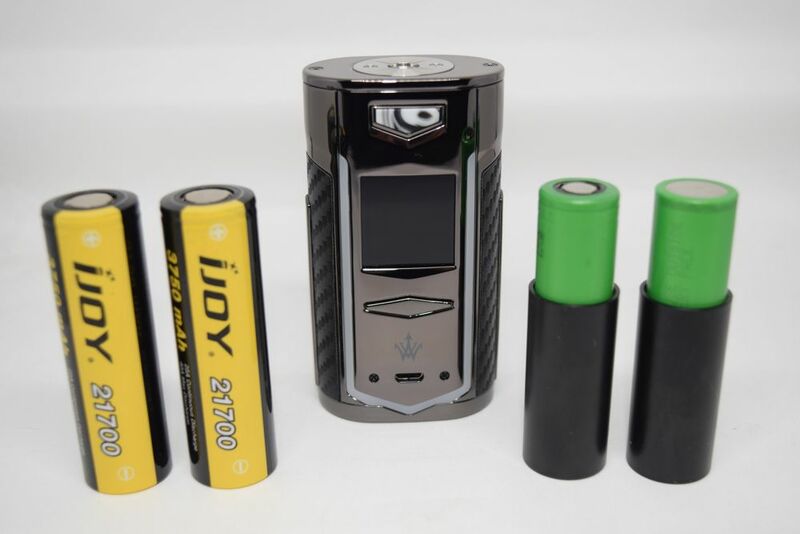 Inside the box you’ll find the X217 vape mod, a micro-USB cable for charging and firmware upgrade, two 18650 battery adaptors, and a user manual. 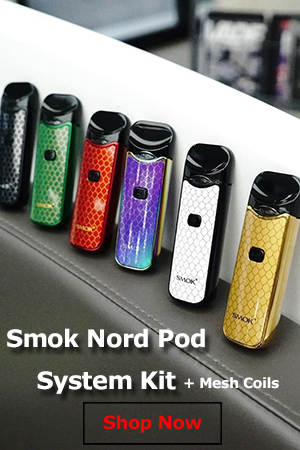 I’m not sure if this device also comes in a kit, bundled with one of the company’s sub-ohm tanks, but the one I received for review only included the mod. 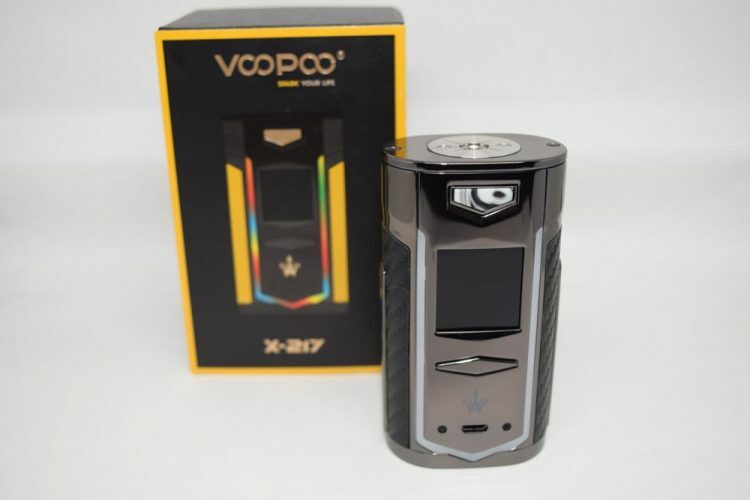 If you’re a fan of VooPoo, the first thing you’re going to notice about the new X217 is that it has a totally different design than the company’s most popular devices, the VooPoo Drag and Drag 2. While those had the classic, rectangular box mod shape, the X217 has a more rounded design, more similar to one of the company’s less known vaping devices, the VooPoo Vmate. However, the build quality of this thing is much, much better than that of the V-Mate, which I personally found to be disappointingly flimsy. 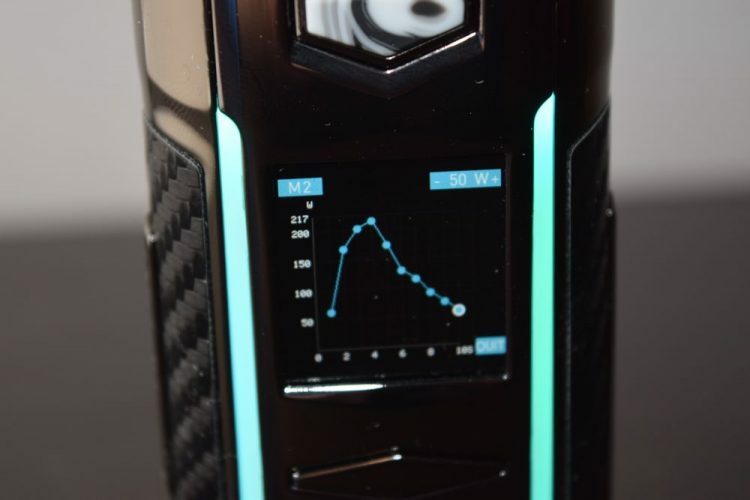 Measuring 93mm x 50mm x 33 mm, the X217 is both considerably taller and bulkier than most dual-battery vape mods, which makes sense, considering its compatibility with larger 21700 batteries. It also feels hefty in the hand, both because of the batteries but also because of the thickness of its zinc alloy body. As I mentioned above, this is a very solid mod that feels like it can handle the occasional drop like a champ, unlike the cool-looking VooPoo Vmate, which felt suspiciously light to me. On the top to the X217 mod, we have a standard 510 connection with gold-plated, spring-loaded pin surrounded by a massive stainless steel plate bolted onto the device to protect its shiny paint finish against scratching, if you screw on an atomizer too tightly. The first RDA I put on it was a 26mm and it looked so tiny that I then switched to a 28mm just to get the aesthetics right. But if you’d like to go bigger, you definitely can. Thanks to its centered connection, the X217 can handle a 30mm without any overhang. 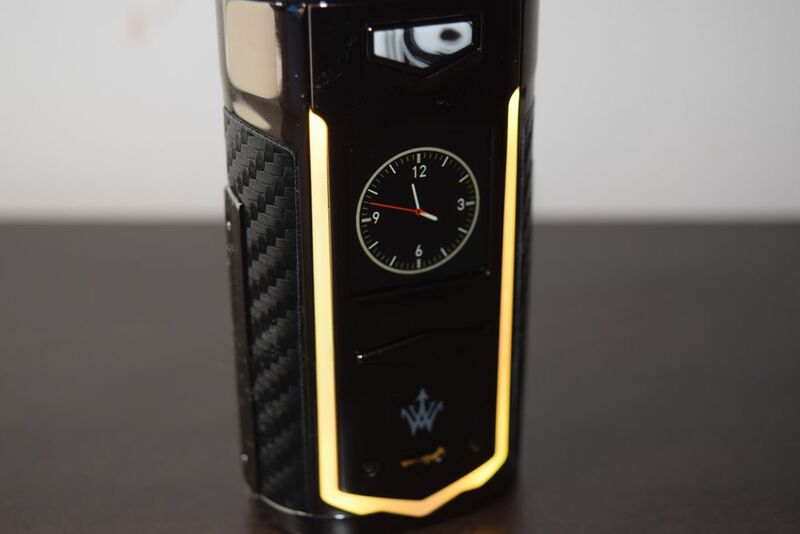 On the front panel of this mod we have a resin-plated fire button, which I personally haven’t seen before, a 1.3-inch square, color TFT display, a diamond shaped button which actually conceals the ‘-‘ and ‘+’ buttons for power adjustment and menu navigation, a cool logo and the micro-USB port for charging and upgrading. 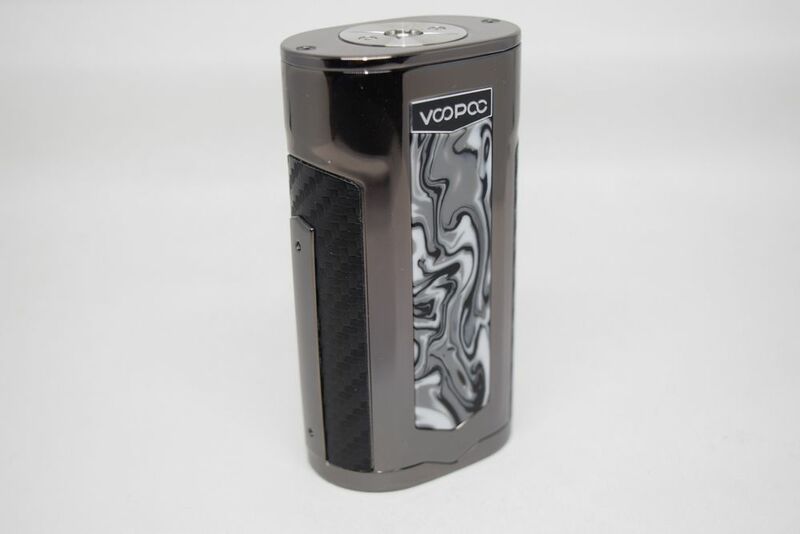 n the opposite side of the device, we have a small VooPoo logo, which is a big change from the massive branding on the Drag mods, as well as a large decorative resin panel which apparently comes in different colors and patterns. 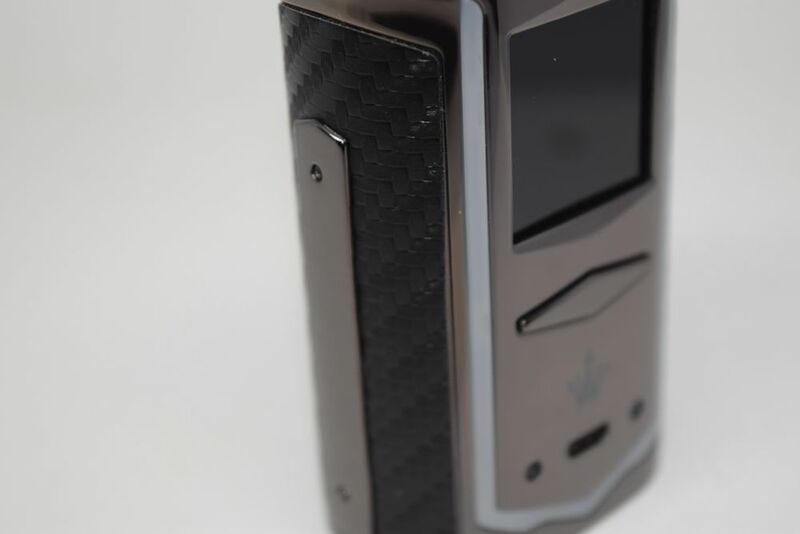 The X217 also features these carbon fiber-like stickers similar to the ones on the old iJoy PD270. 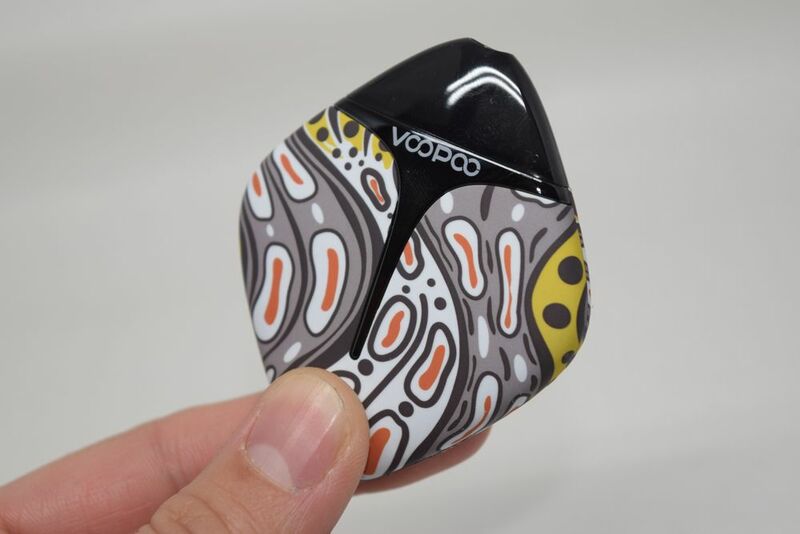 VooPoo advertises them as “textured leather”, but they’re just stickers, I checked. The X217 mod also comes with some bells-and-whistles in the form of a colored LED strip around the front panel. It lights up in different colors and is customizable, but luckily you can also turn it off from the menu. I usually like this type of gimmick, but some reason, I thing this particular device looks better without it. It’s just my opinion of course, so if you’re into flashy LEDs, you’re going to like this feature. The battery door is one of the best I’ve seen on a mod yet. 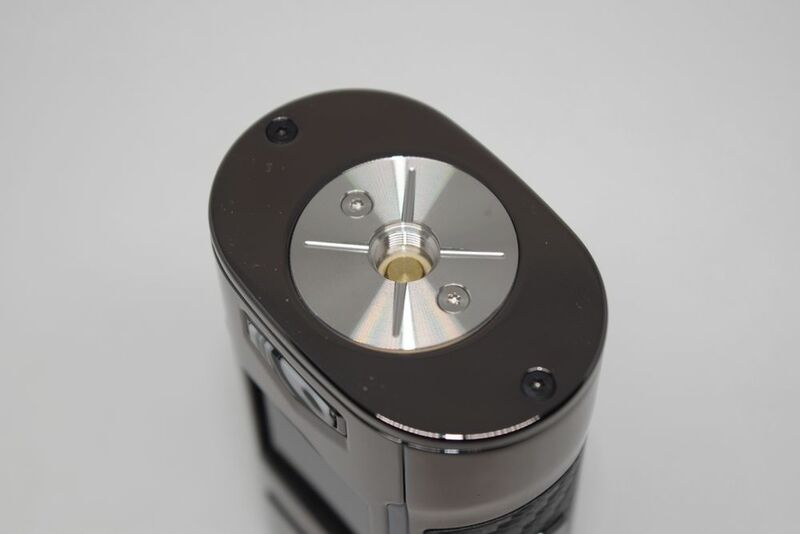 It has a simple sliding switch right in the middle which you can pull on to open the battery compartment, and to close it all you have to do is push it against the mod and it locks into place. There are clearly displayed battery polarity indicators both on the battery door and at the bottom of the battery trays, so unless you choose to ignore them, you should be able to insert the batteries correctly. All in all, I loved the excellent build quality of the VooPoo X217, as well as the fact that it’s not prone to overhang regardless of what diameter atomizer you are using it with. Design-wise, I think it’s quite eye-catching, although there are a few things that could have been implemented better. For example, I’m not a big fan of those carbon-fiber stickers – I have a feeling they’ll start to peel off soon – and the ‘-‘ and ‘+’ mono button is a bit confusing. 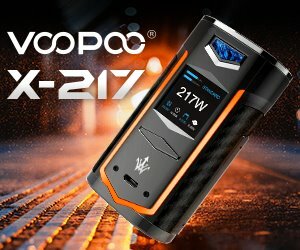 Having tested so many mods in the last seven years, I don’t really bother reading the user manual to figure out how a device works, but I really needed some help figuring out the menu of the VooPoo X217. It’s not particularly difficult to work with, it’s just very different than anything I’ve ever used before. To turn the mod on and off, all you have to to is pres the fire button five times in rapid succession. The home screen has a nice layout, with two separate battery indicators in the top left corner and the current operating mode in the right one. The wattage/voltage/temperature takes up the middle of the screen, and at th bottom you have a puff counter, puff timer, atomizer resistance and a fourth parameter that changes depending on what mode you are in. 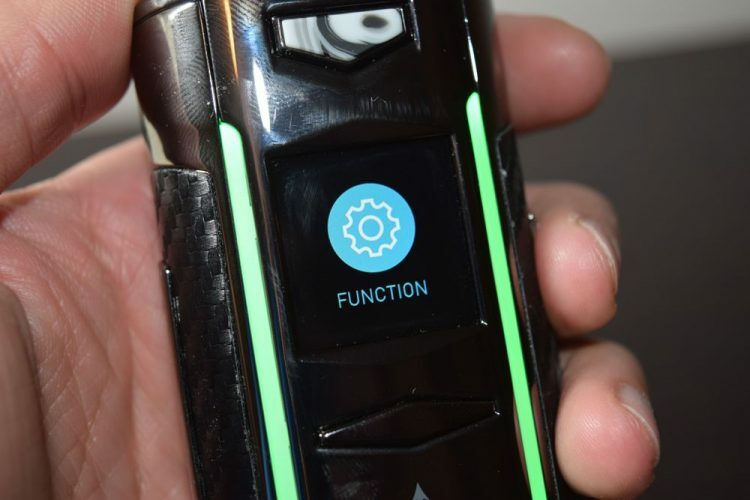 Usually, pressing the fire button three times gets you into the menu, but on the X217 it just switches between wattage mode, temperature control and a gear icon that just says “Function”. I knew there was something hiding behind that icon but I just didn’t know how to access it. I tried pressing the fire button, long-pressing it, just letting it be hoping that it would enter the menu automatically, but nothing worked. It turns out that you have to press the ‘-‘ and ‘+’ buttons simultaneously in order to access the setting s menu, which I never would have guessed without reading the user manual. Once you’re in the menu, you’ll be able to mess with a bunch of settings, including locking the adjustment buttons of your mod, setting the clock that shows up as a screensaver when the mod is idle, adjusting the brightness (big plus in my book), changing the color of the LED strip or turning it off, selecting a wallpaper from 8 pre-loaded images, setting for how many minutes the screensaver remains active, checking the firmware version, etc. Those are some cool settings, but what about the important stuff, right? Like how do you select a material for temperature control, or set the TCR, if you’re into that kind of advanced settings? Well, apparently all you have to do is press the same ‘-‘ and ‘+’ simultaneously in either power mode or temp. control, and it will go into the mode menu. In Wattage Mode the menu will allow you to choose between Standard and Pulse1 and Pulse2 modes, with the latter two reportedly allowing users to vape at higher wattages (over 160W) without accidentally ruining their coils. You can also customize up to five memory modes via an intuitive power curves interface and switch to voltage mode (big plus). In Temperature Control you can select one of three supported materials (nickel, titanium and stainless steel), set the TCR for a certain material, customize five memory modes, set the initial power output for temp control, display temperature in degrees Celsius or Fahrenheit and adjust the resistance of your coils, which I don’t recommend, unless you really know what you’re doing. Overall, a very complex menu, with loads of features, but a bit difficult to get used to, in my opinion. Still, once you get used to the navigation, everything becomes much easier, so I’m not counting this as a con. Battery life is one of the main strengths of the VooPoo X217, if not its main one. You just can’t beat the battery life of two 21700s, so if you don’t mind the size and weight of this device, you’re definitely not going to have to worry about charging your batteries every day (unless you constantly vape at over 100W, which is unlikely). 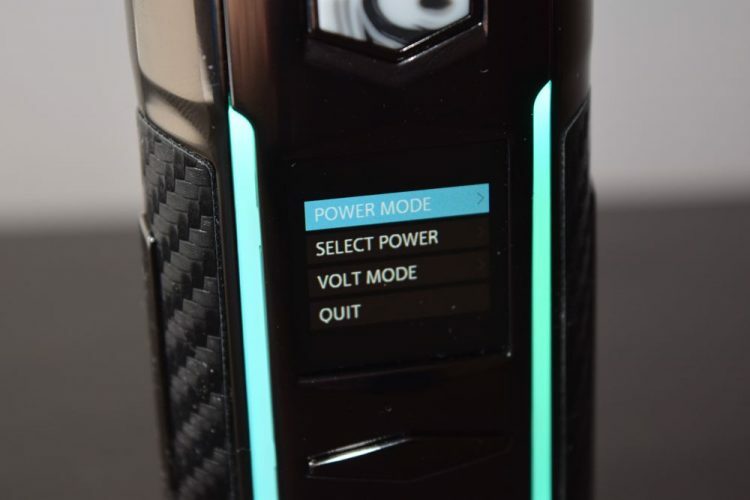 VooPoo’s Gene chip is very efficient in managing battery life so depending on how much you vape and the power output you have set, you can get up to two full days of use out of a couple of fully charged 21700s. The X217 also supports on-board charging, balanced charging and fast charging, but I still highly recommend an external battery charger for extra safety. I do use the mod’s charging feature myself, when I don’t have a choices, but to prolong the life of your batteries, an external charger is ideal. This is a VooPoo device, so I expected the same kind of impressive performance I got from the iconic Drag and Drag 2, especially lightning fast battery activation and fast power ramp-up. The X217 is powered by the same excellent Gene chip as the company’s previous mods, so as far as performance goes, it doesn’t disappoint. It fires almost instantly and the power ramp up is just as fast as that of the Drag 2, so using it in power mode – especially in a customizable memory mode – was a pleasure. I can’t comment on the accuracy of temperature control, because I didn’t really test it. I’ve never been a fan of this mode, and I personally don’t know anyone who uses it over power mode, but I’m sure you can find a review that touches on this feature on the internet. 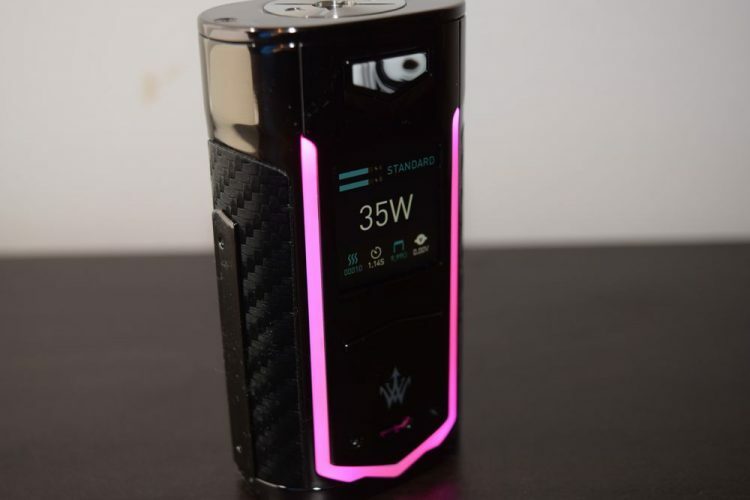 The VooPoo X217 has a maximum power output of 217W, and although I would never vape at that high a wattage, I’m pretty sure it can actually output that much power, in the right conditions, at least when used with 21700 batteries. I’m happy with its performance at 80W, so I don’t really care about its max power output, to be honest. I’ve been using the X217 mod for over 2 weeks now, and I haven’t run into any performance issues yet. The power button is responsive, the Gene chip does what it’s supposed to, and the battery life is great. The X217 looks a lot different than most of VooPoo’s vape mods, but that’s not necessarily a bad thing. 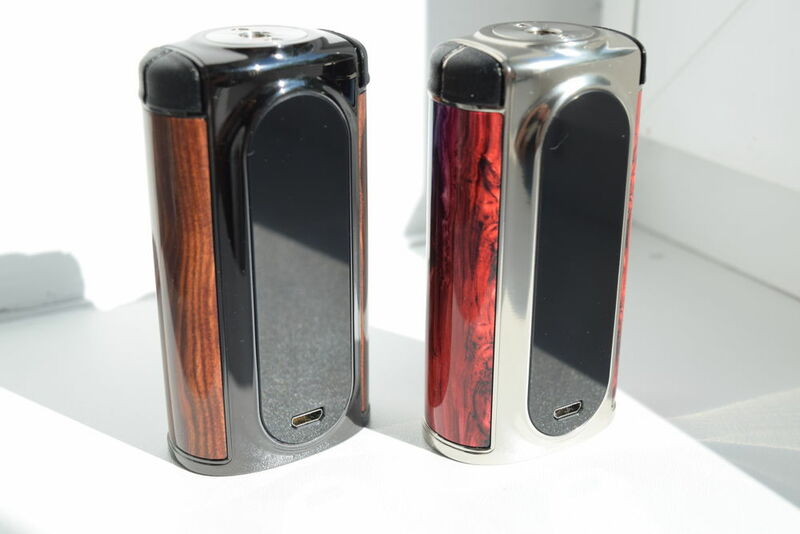 I happened to like this change in design, and if you like rounded, ergonomic dual-battery mods, you will too. Its size and weight may be an issue for some people, but the battery life more than makes up for that, so I wouldn’t necessarily call them negatives. And, most importantly, the Gene chip inside this device is as awesome as ever, delivering excellent performance with every press of the fire button. So would I recommend the VooPoo X217? Definitely! I’m glad we finally have a 21700 battery-compatible mod and a high-quality one to boot.